The historically low black unemployment rate has become one of Donald Trump’s favorite statistical claims, one he is likely to tout again at the upcoming State of the Union address. The fallacy of touting this as a genuine accomplishment of the Trump administration rather than fortuitous timing has been noted by me and others on multiple occasions. Still, at the start of Black History Month, it’s useful to provide some facts about the African American labor force that you will probably not hear during the presidential address to Congress. To begin with, it is true that the 2018 black unemployment rate was the lowest it has been since the Bureau of Labor Statistics began reporting it in 1972. But little, if any, credit for that belongs to the Trump administration. As the graph below clearly shows, the black unemployment rate had been steadily falling since 2011, well before Trump was sworn into office, and the rate of decline has not gained momentum since. Arguably, the decline of the black unemployment rate to its current level has more to do with the Fed’s decision to keep interest rates at or near zero for an extended period of time—decisions led by the two previous Federal Reserve chairpersons. However, even at an annual rate of 6.6 percent, the black unemployment rate was still more than double the white unemployment rate of 3.2 percent in 2018. In fact, the graph also shows that the last time the white unemployment rate was 6.6 percent was six years earlier in 2012, when the black unemployment rate was 14 percent. If you’re starting to see a pattern emerge, then the shortsightedness of Trump’s boasting about the black unemployment rate should also be apparent. 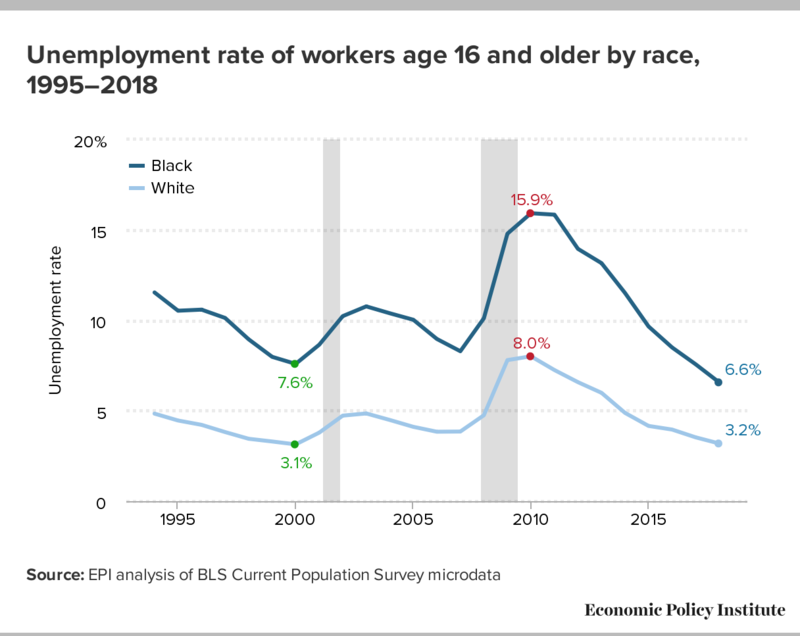 The black unemployment rate has been about double the white unemployment rate for more than four decades, making this relationship more historically significant than any single unemployment rate. And, it is the durability of this gap that allows blind celebration of an unemployment rate that is higher than that of any other race or ethnicity reported by BLS, when the more appropriate response would be to focus on solutions for closing the gap. Even so, the significance of 6.6 percent as a “historic low” deserves a closer look. Prior to the current period of economic expansion, the black unemployment rate had not been anywhere near this low in almost 20 years. The average black unemployment rate in 2000 was 7.6 percent, but a lot has changed since then, as the workforce has become older and more highly educated. In a previous post, my colleague Elise Gould and I showed that although the black unemployment rate in July 2017 was just above its monthly low from April 2000, the strength of the labor market during those two points in time was actually quite different. Given that the black unemployment rate has continued to fall since then, an update of that analysis is warranted. Let’s begin with muting any effect the aging of the workforce might have on the unemployment rate. The prime age (25–54 years old) employment-population ratios (EPOPs) can be used to roughly factor out any structural changes resulting from the growing share of retirees. 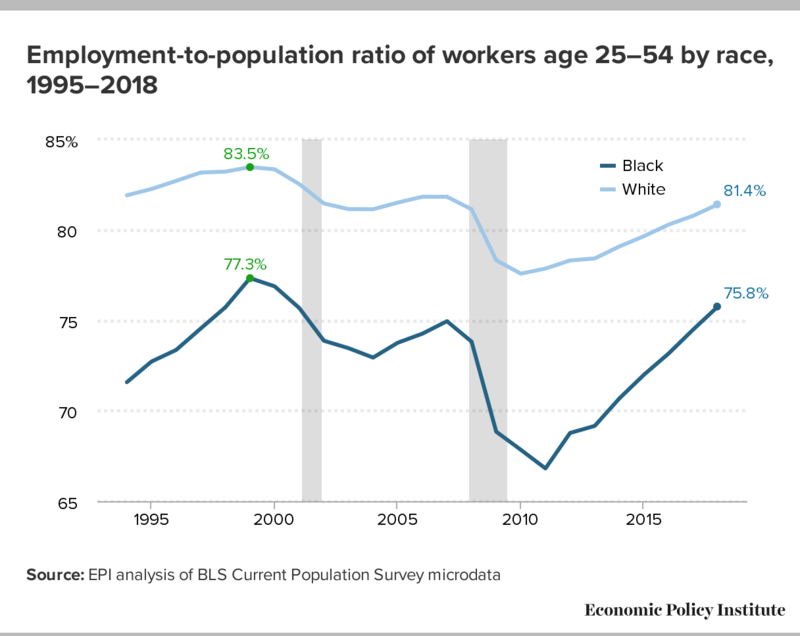 Comparing 2000 to 2018, we find that 77.3 percent of black prime age adults were employed in 2000, while 75.8 percent were employed in 2018. Even at the lower unemployment rate in 2018, a smaller share of prime age adults—the group with the strongest attachment to the labor force—were working. This was true for whites as well. Since 2000, the share of college-educated workers has also grown. The share of African Americans with a bachelor’s degree or higher grew from 14 percent in 2000 to 22.8 percent in 2018, an increase of 63 percent. 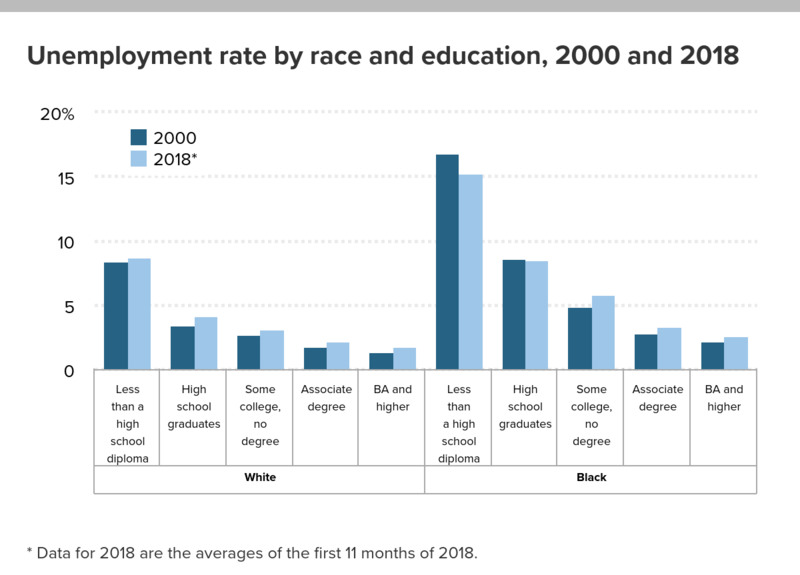 Since unemployment rates tend to be lower for workers with higher levels of education, the lower 2018 unemployment rate reflects not only improvements in the economy, but also the fact that black workers today are more educated than ever before. In the graph below, you can see how higher levels of education correlate with lower unemployment rates, but significant racial disparities in unemployment are present at every level. This graph also shows how the 2018 unemployment rates within most educational categories are no better (and in some cases worse) than their respective comparison groups in 2000. This is another indication that even at a lower unemployment rate in 2018 than in 2000, the labor market is not providing significantly better employment outcomes relative to those available in 2000. * Data for 2018 are the averages of the first 11 months of 2018. When the American people watch the State of the Union address, with all of its grand proclamations and pageantry, we should keep this unfortunate truth in mind. The annual black unemployment rate has only been in the single digits 10 of the last 47 years that BLS has reported it. In the last 65 years that BLS has reported the white unemployment rate, it has always been below 10 percent. A 6.6 percent black unemployment rate is definitely noteworthy, but credit belongs to those whose leadership over the past eight years steadily brought it down from 16 percent. The Trump administration should be judged by what they do to keep the rate down, and to close the persistent 2-to-1 racial disparity. That would be a truly historic accomplishment worthy of everyone attending the State of the Union rising to their feet in thunderous applause.